I ran across this story recently of two men who were detained for two hours at the U.S.-Canada border after border agents discovered that the pair were attempting to bring illegal firearms drugs invasive bug species chocolate kinder eggs into the Unites States. You know, kinder eggs – the chocolate eggs with the toy inside. Now, I get it. Biting into one of these eggs is potentially tricky business – the toy inside is hazardous to teeth and dental hardware, and depending on the size of the toy and the size of the person eating the egg, a potential choking hazard. But I would never have guessed that the possession of chocolate could subject the smuggler to a hefty fine. But, like the men who were questioned about the contraband, I wonder why the eggs weren’t even confiscated from their car. Indeed, the pair was eventually allowed to bring the chocolate into the country. So much for border security. Reading this story made me curious about two things. First, from a products liability perspective, what happens now if one of these eggs does cause someone to choke or lose a filling? Who could face potential liability? Can a manufacturer be held liable for injuries caused by a product in a country where the product is banned? What about the U.S. Government, which allowed a banned, “adulterated food object” enter the country it knew was a choking hazard? Or, the men who, after being detained, would have been aware that they were distributing a hazardous food? Second, I became curious about what other odd items have been banned from import into the United States. I consulted the U.S. Customs and Border Patrol website, but really all I could find was this general list, which failed to provide any real details about specific products that, if discovered, might be confiscated. I am, however, now aware that I cannot import dog or cat fur into the U.S.
Chew on that one for a little while. Oh man… I loved those things as a kid! Very tasty! Not to mention there is a second treat after the initial indulgence of goodness. Come to think of it I never bit into the chocolate not knowing that there is a toy inside. 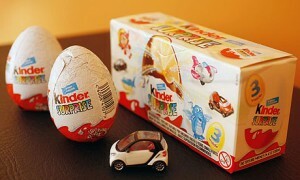 It may be careless to say that every kid knows the kinder egg is hiding a toy and will avoid biting straight into it. As for adults, well they should know better.